Dey’s Skating Rinks were significant in the early development of organized hockey in Ontario. The Dey family owned a large boat-building business in Ottawa and was a major promoter of hockey. The first rink (1884) was located on the Rideau Canal, but was moved to make way for construction of the railway. On December 17, 1896, the second Dey’s Arena opened on Gladstone Avenue, and was one of the largest indoor ice surfaces at the time in Canada. The Ottawa Hockey Club began playing out of this arena in 1897. 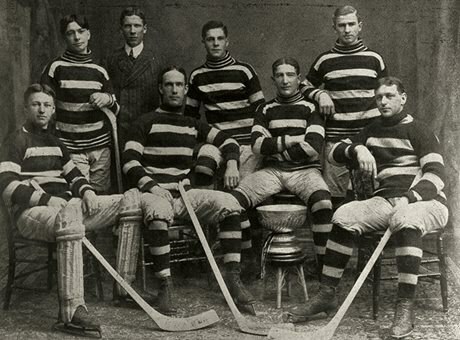 In March 1903, the team defeated the Montreal Victorias to win Ottawa’s first Stanley Cup. In the 1905 Stanley Cup final, the Ottawa Silver Sevens defeated the Dawson City Nuggets 23-2. In 1907, the third Dey’s Arena opened on Laurier Avenue. Known as “The Arena,” it had a capacity for 7,000 spectators. In 1920, the rink was destroyed by fire. A commemorative plaque is located where the arena once stood. Visit the City of Ottawa plaque at the corner of Gladstone Avenue and Bay Street in Ottawa, Ontario. Listen to an interview from the Library and Archives Canada website with hockey historian Paul Kitchen on the origins of hockey and Dey’s Arena. Learn more about the evolution of the Ottawa Senators on their website.